Print your logo onto these custom printed compact screwdriver sets or one of our other innovative car accessories / automotive and use them in your next marketing campaign as a unique giveaway item. Compact Screwdriver Sets are a handy tool that everyone needs to keep on hand, they feature a 6 piece screwdriver set that slides into a case.. These easy fix it tools make a perfect branded giveaway. These are a handy giveaway for any promotional or marketing campaign. Be the helping hand that everyone needs! Custom brand these car air fresheners or one of our best-selling promotional car accessories / automotive with your company logo! 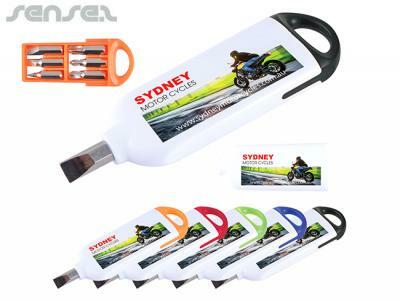 Personalise your compact screwdriver sets or custom design car accessories / automotive for your marketing campaign. How can these unique promotional compact screwdriver sets or our personalised car accessories / automotive fit in with your marketing strategy and help you maximise your brand exposure? Our custom made Compact Screwdriver Sets can be produced from a minimum quantity of 100 pieces. We can have your logo branded on these corporate Compact Screwdriver Sets in Full Colour Digital Print or 1 Colour Pad Print. A setup fee of AU$160.00 will apply to make the film.